Kristian currently leads all corporate communications, marketing and brand globally for dnata & Group Brands as part of the Emirates Group. His global remit covers a large and diverse portfolio, extending across 83 countries and covering over 52 different brands and business units. 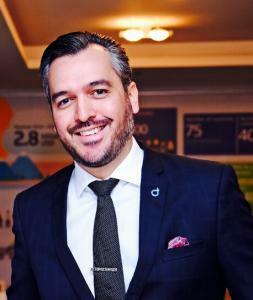 In his role at the Emirates Group Kristian is also part of the global dnata management team where he leads all communication efforts to support dnata’s global positioning and reputation with employees, customers and business partners. Kristian’s scope also extends to CSR where he currently serves as the Secretary General for dnata’s charity arm – dnata4good. To date dnata4good have raised over USD$1 million to fund schools abroad and wildlife conservation – specifically rhinos. Prior to joining the Emirates Group, Kristian worked across Asia Pacific with some of the world’s leading global brands. Firstly in Australia as part of DDB working with a number of brands including BP and ANZ; and more recently in Singapore also with DDB where he was part of the Asia Pacific regional team managing McDonalds and Philips.With over 15 years’ experience in communications and marketing, Kristian began his career working in the Australian advertising industry in account management. Kristian holds a Masters in Marketing from Monash University in Melbourne, Australia. Originally born in Australia, Kristian is half-Samoan and has lived in both countries as well as Fiji, New Caledonia, Papua New Guinea, Malaysia and Singapore. He is now settled in Dubai with his wife and two young daughters.